If you’re craving something savory and a little sweet, look no further. In this recipe, pork tenderloin is rubbed with garlic powder, onion powder, and smoked paprika, which bring exciting flavors to the mild meat. It’s then pan-seared until crusty and blackened on the outside and bathed in an apricot balsamic glaze that lends a touch of sweetness. 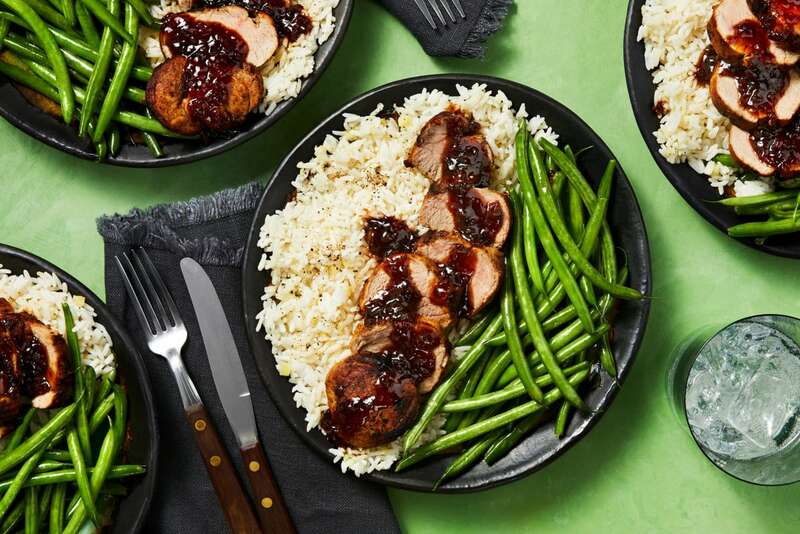 The sweet-savory pork combo is served over a bed of ginger rice and green beans that packs a one-two punch. Wash and dry all produce. Halve and peel shallot, then mince until you have 3 TBSP (use the rest as you like). Peel, then mince or grate ginger. Pat pork dry with a paper towel. Melt 1 TBSP butter in a small pot over medium-high heat. Add ginger and cook until softened, 1-2 minutes. Add 1 stock concentrate and ¾ cup water. Bring to a boil, then add rice. Cover, lower heat, and reduce to a gentle simmer. Cook until tender, about 15 minutes. Heat a large drizzle of oil in a medium pan over medium heat. Season pork all over with salt, pepper, and 2 tsp fry seasoning (we sent more). Add to pan and cook, turning occasionally, until blackened all over and desired doneness is reached, 15-20 minutes. Set aside to rest on a plate. Rinse out pan used for pork, scraping out any browned bits, and dry well. Return to stove over medium-high heat. Add shallot and 1 TBSP butter. 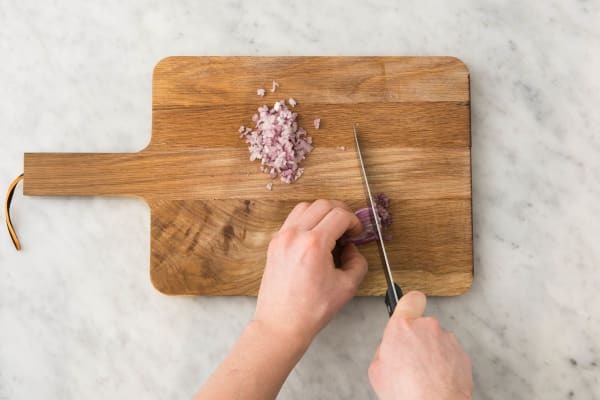 Cook, tossing, until shallot is softened, 2-3 minutes. Stir in jam and vinegar. Let simmer until syrupy, about 1 minute. Stir in remaining stock concentrate, ½ cup water, and 1 tsp sugar. Bring to a boil, then lower heat and reduce to a simmer. Let bubble until thickened, about 4 minutes. 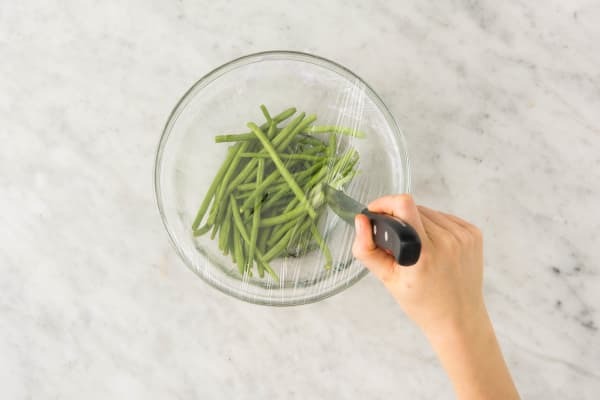 While glaze simmers, place green beans and a big splash of water (we used ¼ cup) in a medium microwave-safe bowl and cover with plastic wrap. Poke a few holes in wrap. Microwave on high to desired doneness, about 2-3 minutes. Drain well. Toss with sesame oil. Season with salt and pepper. 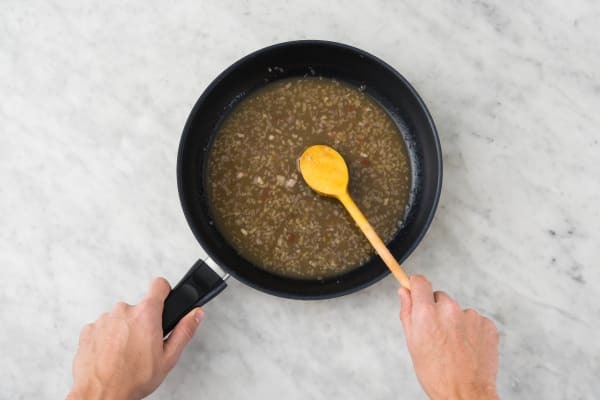 Once glaze is thickened, remove pan from heat and stir in 1 TBSP butter. Season with plenty of salt and pepper. 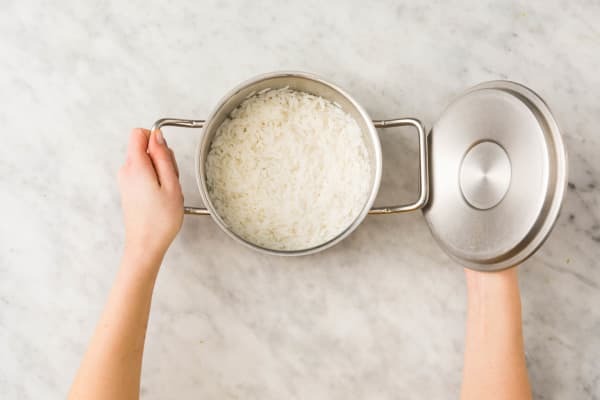 Fluff rice with a fork. Season with salt and pepper. 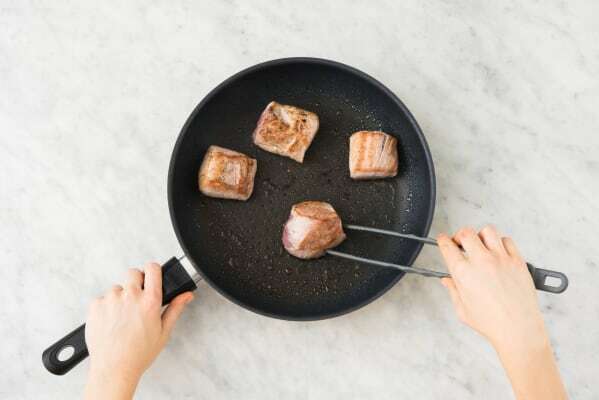 Stir any juices from pork into glaze in pan. Slice pork crosswise into medallions. 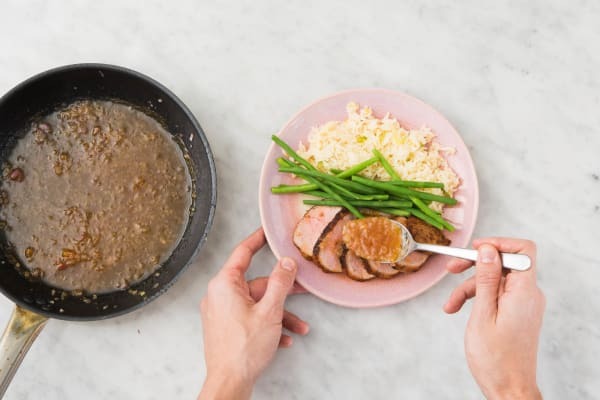 Divide rice, pork, and green beans between plates. Drizzle glaze over pork and serve.